Hello Everyone, its very exciting week for Winnie and Walter, they are releasing the new upcoming products for October 2014. 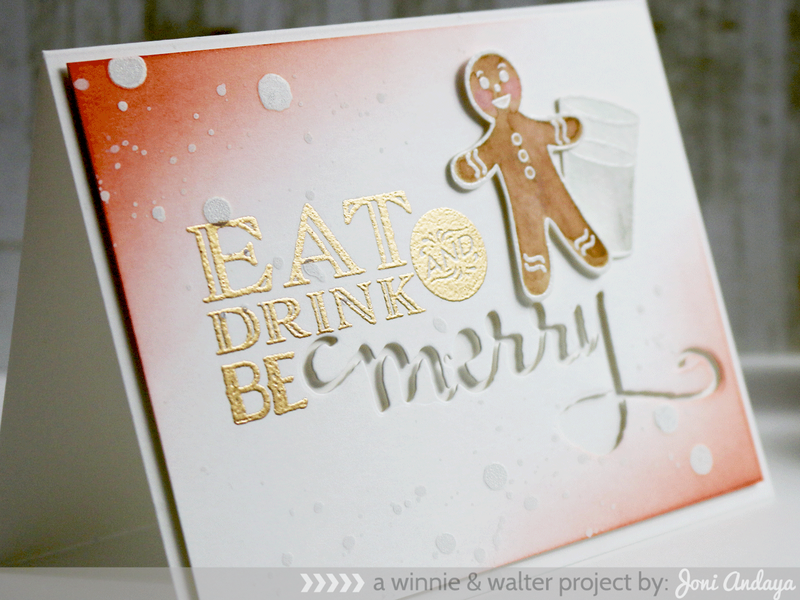 For my first project I used the new Gingerbread Man stamp set with the new Cutaways (more on this product on the 3rd day previews). I first gold embossed the sentiment from Gingerbread Man and added the long awaited Cutaways in "merry". Next, I distress the corners of the card panel in Wplus9 Flamingo dye ink and Sweet Nectar dye ink. For my Gingerbread Man and cup of milk I white heat embossed first then watercolor it down. I then fussy cut the images once its dried and adhered on the card with foam dots for dimensions. For final touch I splattered it with October Afternoon Sprinklers in Paper Doily. For my second project we are showcasing the new product line for Winnie and Walter called Creative Screenings these are the new stencils that will be available for purchase. For the background I used the Scenery: Triangled Creative Screenings I distress using Distress inks in Peacock Feather and Crushed Olive. Next, I die-cut the Cutaways from The Big, the Bold and the Merry (holiday) in black cardstock and adhered it at the middle of the cut space at the bottom. I also stamped the (sentiment happy) from the Winter Woodland stamp set which will be showcased tomorrow. 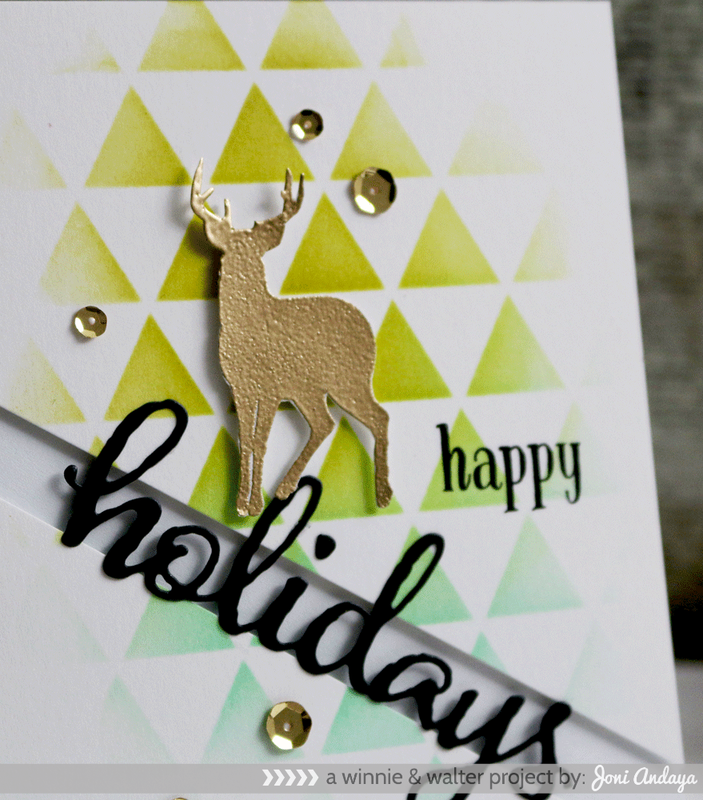 I also included the fussy cut gold embossed deer, also from the Winter Woodland stamp set. Next, I added some Gold sequins from Pretty Pink Posh in 4mm & 6mm to finish off the card. Great cards, Joni! Both are perfect!!! These are gorgeous! LOVING that gingerbread man!!!! 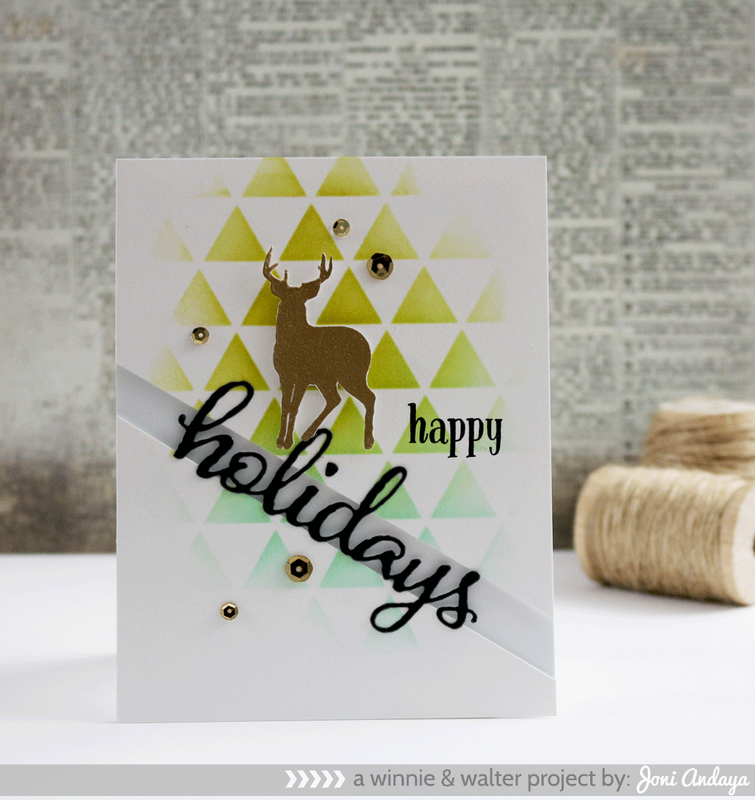 Your happy holidays card is gorgeous! wow, these are so beautiful! LOVE the background with the deer and the angle! :D:D Joni, I loved the second card!!! These are lovely cards,my fave is the reindeer!! Beautiful cards, Joni! Love your style! Adorable first card and I love the split in the second with the word die on top! I liked all the different techniques you used on the gingerbread card. Two superbly pretty cards, Joni! Wow! I'm blown away by your cards, Joni, and this month's release! Gorgeous cards! I LOVE the last one! 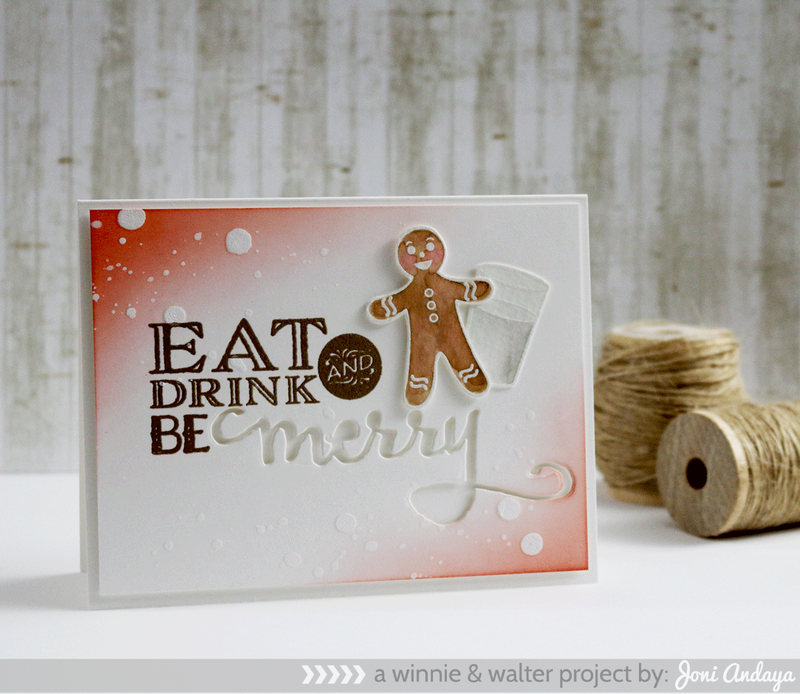 That gingerbread man is the cutest:) Your second card is stunning! The Holiday cutaways is so beautiful!!! Love the gold deer! Very exciting release! Great cards. I love the beauty of the second one. Gotta have the gingerbread man. He is so very cute. These are both so gorgeous, Joni!! I adore the inked edges, & how you masked the sentiment & added the diecut merry on the first one! And the distress inking with the creative screen is perfection!! Gorgeous cards Joni. I love those cutaway words - fabulous fonts.